Wingers Aphiwe Dyantyi and Makazole Mapimpi scored two tries each as South Africa rallied in the second half to beat Argentina in their Rugby Championship opener on Saturday. The Springboks out-scored the Pumas by six tries to three, winning 34-21, but again made heavy work of their victory before finishing strongly in Durban. 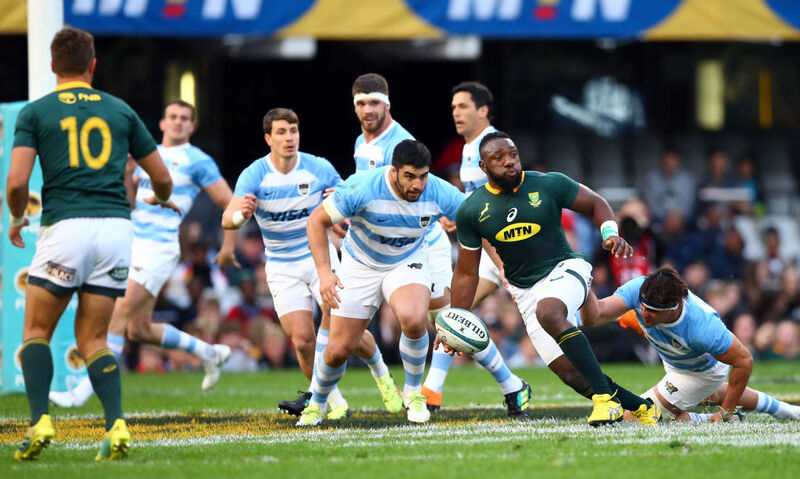 Lukhanyo Am and Faf de Klerk claimed South Africa's other tries while Nicolas Sanchez, Pablo Matera and Matias Moroni crossed the line for Argentina. The Boks continued a trend set in the first two matches of their three-test series against England in June when they went behind early and were forced to come back to win. “We didn’t start well as we made a lot of mistakes which was disappointing because we’ve been working hard on our discipline over the last weeks,” South Africa captain Siya Kolisi said. The Springboks were 14-5 behind after 30 minutes but by halftime had reduced the deficit to four points and scored four tries after the interval to ensure a winning start to the annual southern hemisphere competition. But there will be concerns for coach Rassie Erasmus after flyhalf Handre Pollard kicked over just one of six attempts at posts and the hosts, turning down kickable penalties to go for touch instead, botched the resultant close-in line-outs. Am opened the scoring after eight minutes but Argentina hit back quickly as they took advantage of errors to see Sanchez and Matera over the tryline. Dyantyi, named man of the match, carried over a superb cross field kick from Willie le Roux to launch the home recovery before the break and two minutes after the interval went over again as the Boks took control. Mapimpi, in his second test, scored two tries in a five- minute spell soon after before Moroni’s intercept try reduced the home lead to 27-21 with just over 10 minutes left. De Klerk, however, darted over for the sixth home try as consistent pressure wore down the Pumas defence. The teams meet again in Mendoza next week. Earlier on Saturday, the All Blacks beat Australia 38-13 in Sydney in the opening game of this year's competition and first Bledisloe Cup test.